Loyal Reader Kate T. has alerted me to a valuable mustache resource. 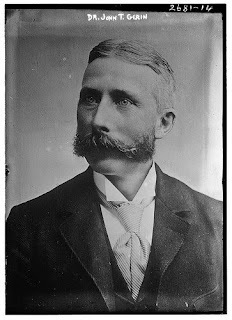 As reported by the indispensable Indicommons, a "Great Mustaches of The LOC" tag has been added to the Library of Congress photostream on Flickr. While most of the images already tagged are not of the Nineteenth Century vintage, there are many fine examples of the styles that survived until after The War To End All Wars. For example, Dr. John T Gerin's impressive, yet still professional, faceshelf. A "Good Show" to all involved! two posts in as many days? a jolly good show, indeed! I believe you are thinking of Howard Hughes, who grew his pencil mustache to hide his scar resulting from a plane crash. What are the chances of you lovely gentlemen adding our name to your friends links list. We shall be doing the same for you now! Mustaches for all! It's like he's got a scalloped edge to his face! This is simply brilliant. Something all good men should ascribe to. I am sweating right now as I try to push out the hairs to create an inspired masterpiece in the footsteps of this fine gentleman. Haha! I'll have to keep my husband away from this site. He'll be trying them all in a minute. Love it! Is it just me, or were older mustaches just... bigger? Ha. Obviously, I run primarily a shaving blog, but I've been thinking of growing a mustache for a while. And if I'm going to do it, why not emulate one of these fine specimens! Very love it Thanks You !